A while back I scoured the clearance rack at the Oltorf HEB and scored a number of gems. Besides crazy clearance prices on herbal supplements, the store was discontinuing a few Middle Eastern food items like Israeli couscous and fine semolina. I couldn’t pass up a couple a cheap, cheap bags of semolina. I threw them into the freezer to await whatever project might call for a cup or so. Last week at the Austin Farmers Market I bought a pair of cheeses from Brazos Valley Cheese, a young tangy parmesan and a pleasantly pliant Montasio. 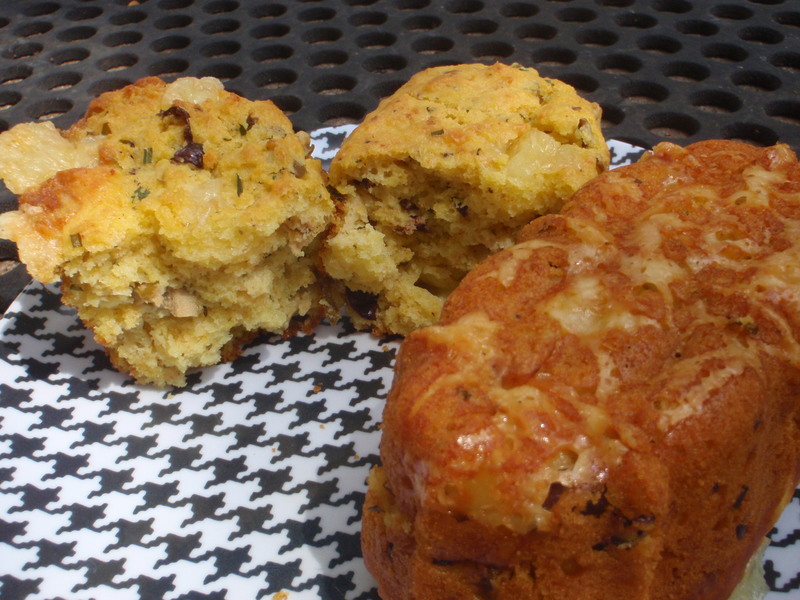 Here’s an easy quick bread to showcase those quesos and press your semolina into action. 2 teaspoons baking powder, sieved. I use Rumford non-GMO, aluminum free. ½ cup organic or local olive oil. Check out Texas Olive Ranch. 1 Tablespoon minced fresh rosemary. You too can grow this hardy herb. 1/3 cup minced garlic chives or regular chives. Only my garlic chives survived this summer of neglect! 1 ½ cups yogurt, local, organic or homemmade. I make my own yogurt from either Swede Farm Dairy or WaterOak Farms goat milk. Click for instructions. 2 local eggs. Austin’s own Vital Farms was just awarded Certified Humane® status from the Humane Farm Animal Care organization. Local eggs abound in our town. Check the farmers markets or ask your neighbor. 1 cup olives, drained, pitted and chopped. I like a mix of black and green. Preheat oven to 350°. Grease up 4 mini-loaf pans (about 3½” X 6″. I use my fancy Nordic Ware Bundt® design four-cavity pan.) Olive oil or melted butter (check out Natural Grocers sale on Organic Valley 1# butter for $4.49 through September 25) both work. You can also use one 9″ X 5″ loaf pan. The larger size takes a little longer to bake and a lot longer to cool off so I prefer the smaller loaves, so we can eat the bread right away! Combine the dry ingredients, flour through the pepper, in a large bowl, whisking to mix. Add the cheese chunks and toss with a fork to distribute. Pour the olive oil into a smaller bowl and stir in the herbs. Add the remaining ingredients, through the olives, whisking well to blend. Sprinkle the bottoms of each pan with the shredded parmesan. For non-fancy pans, save the parmesan for sprinkling onto the tops of the unbaked loaves. Pour the yogurt mixture onto the dry ingredients and stir gently with a flexible spatula to combine well. Scoop the batter evenly into each pan. Top now with the parmesan if your pans are flat-bottomed. Bake until a bamboo skewer inserted into the center of the bread comes out clean, about 30 minutes for mini-loaves, 55 to 60 minutes for one large loaf. Let cool in the pan on a rack for 10 minutes before carefully (cheese likes to stick) unmolding the breads onto a rack to finish cooling. Please let the larger loaf cool almost completely (what torment!) to set the structure before eating. You can enjoy the smaller loaves now!